In the living room of my parents Florida apartment, my mother covered a large sea grass papered wall with 4 pairs of wall brackets, each with a Latin American santos statue on it. It looked fabulous. Wall brackets are great for display, but also can fit in almost any space or room. 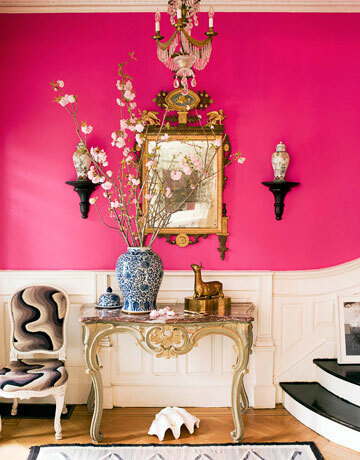 Think of the small entryway that needs some design pop - add a pair of brackets on either side of a mirror and put some inexpensive vases on top. Buy a mismatched group of brackets, put them on a wall behind the bed or sofa, and place some objects on each. Instant chic, and not expensive. 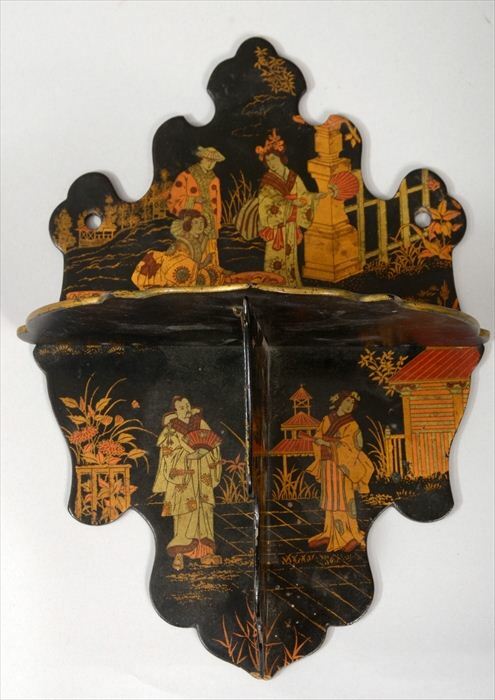 In keeping with the theme that anything chinoiserie works in any decor, this Chinese export papier-mache wall bracket would be perfect. The design is decorative on it's own and place a simple blue and white vase on top and you have a chic display. This is offered in the next Stair Galleries auction in Hudson, NY February 4th. It's Lot 324, is 10.75" tall, and has an auction estimate of $50 - $70. 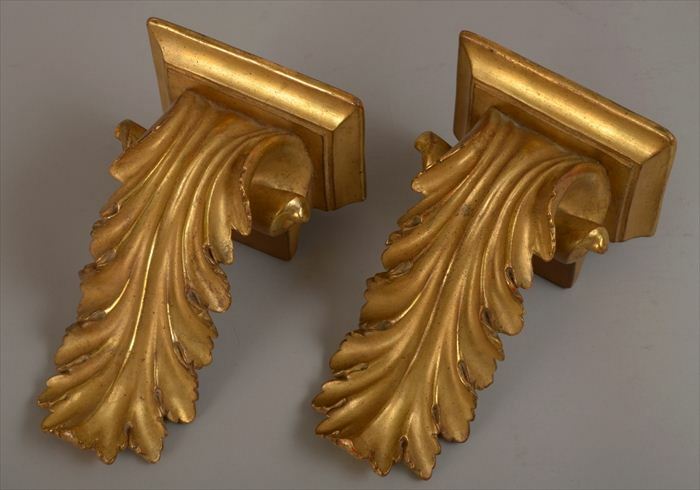 The same Stair Galleries auction includes this pair of Neoclassical style gilt plaster wall brackets (9.5" tall). These are quite decorative and would look great on either side of anything - a mirror, a painting, a doorway... These are Lot 297 and have an auction estimate of $50 - $75. 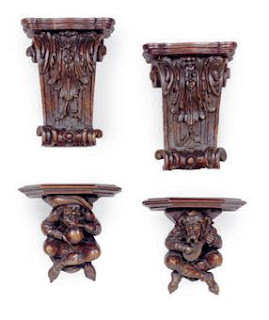 These two pairs of carved wall brackets sold at a Christie's New York auction for $375, which was below the estimate of $500 - $700. You could use these together on one wall, or a separate pairs. I think the figurative carving on the bottom set is quite whimsical. 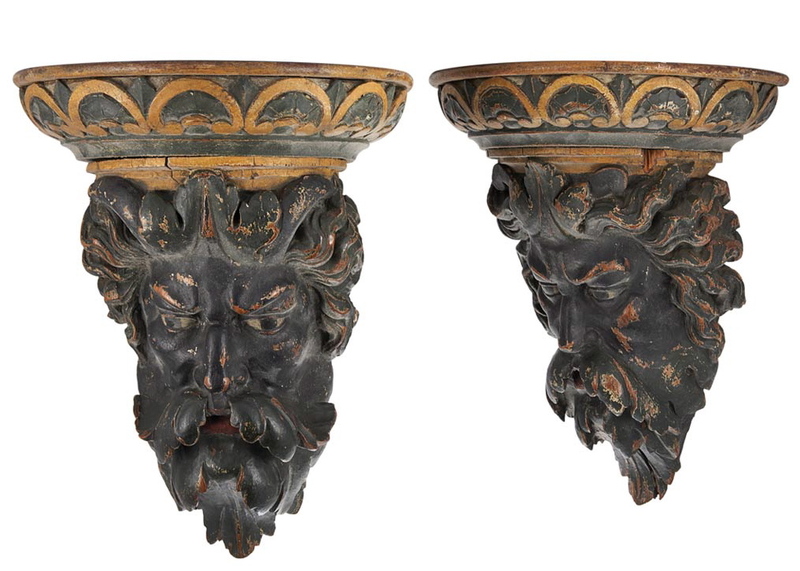 This pair of George III style gold painted carved wood brackets sold at a Bonhams auction for $538. 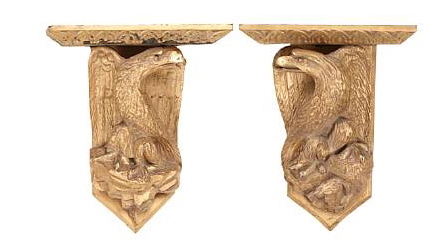 Eagles are always very smart, and these brackets are decorative objects in themselves. For more of an investment, this pair of 19th century Northern European carved wood brackets sold at a Doyle New York auction for $3,125, which was well above the auction estimate of $1,500 - $2,000. I can see why. These are very good looking, and only call for something simple on top, if anything at all. 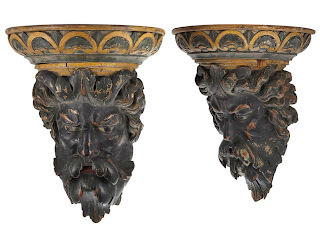 I could see these in a powder room on either side of a mirror where you and your guests could look at them close up. 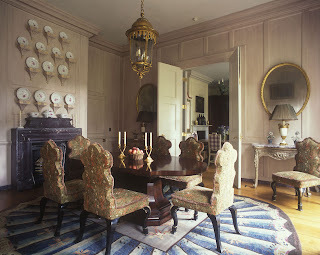 I love the idea of a group of brackets taking up a large wall space and making a statement. They need not match, in my view. They also don't need to be topped with expensive collections. The wall bracket will often have a lot of decorative impact itself. 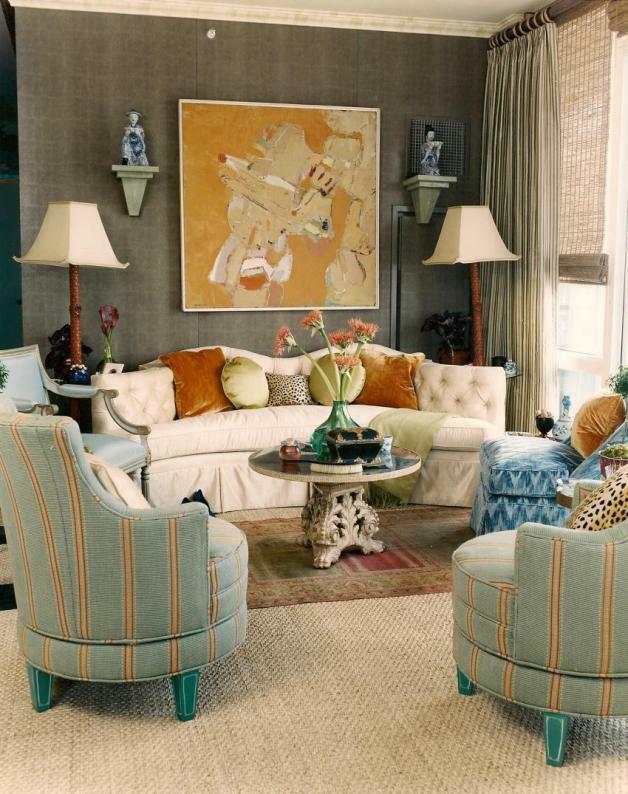 These are fun to collect at auction as pairs or single pieces, and then plan and create your wall design!